A "gameful" learning tool created at the University of Michigan is now available for purchase by K–12 schools and universities across the country. Known as GradeCraft, the software uses gaming elements such as competition, badges and unlocks to help students progress through their courses. To use GradeCraft in a course, instructors create a course shell as they would in a typical learning management system. Students use a tool called the "Grade Predictor" to plan their own path through coursework; when assignments are completed, the system then nudges students to revisit their plan based on their interests and performance. Students also receive analytics to help gauge their overall progress. 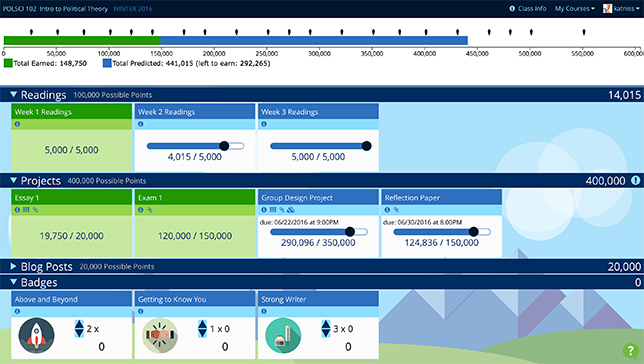 GradeCraft's "Grade Predictor" tool helps students plan a personalized pathway toward their learning goals. GradeCraft was co-developed in 2012 by Barry Fishman, a professor at the University of Michigan's Schools of Information and Education, and Caitlin Holman, doctoral candidate in the School of Information and lead software developer at Office of Academic Innovation's Digital Innovation Greenhouse. The project was recognized with a Campus Technology Innovators award in 2016. To date, the system has been used in 56 courses across the university, including a series of massive open online courses — serving more than 10,000 students overall, according to a university statement. "We believe gameful is a great way to reconnect students to learning and we're excited to bring it to a larger audience," Fishman commented. For more information, visit the University of Michigan site.